Less than 100 Facebook Fans? Use Constant Contact’s social media tool to boost that number. Constant Contact is one of the first companies that brought easy email marketing to small businesses, and now it’s launching a new product that aims to bring easy tools to enhance their social media marketing. Constant Contact’s social media marketing tool will not only jazz up your Facebook Page, but will give you further reach on other social networks including Twitter and LinkedIn, as well as providing a set of analytics tools to better understand how customers are interacting with your campaign. When it comes to setting up your Facebook welcome page using Constant Contact, unlike most other services, the first page that potential customers see isn’t just a welcome page, as there are several more elements to it. 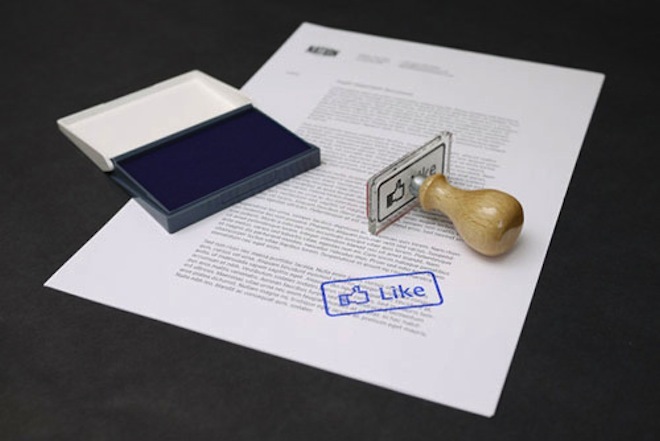 One feature Constant Contact provides is ‘like-gating‘ – in other words – you have to like the page in order for the content to be revealed, or to benefit from a special offer. This practice has been criticized by some, but for the most part does not seem to have created too much controversy. What’s great about how Constant Contact’s welcome page works is that while you’re running a campaign through their service, that’s the first page a user will see when they visit your Facebook page. If you’re not running a campaign, it will default to Constant Contact’s basic welcome page. Constant Contact’s social media marketing tool is a standalone tool and can be used independently of the other available products, so if you’re not already a customer, you can simply opt for the social media marketing tool if that’s all you need. After you sign up for an account, it’s extremely easy to get your page up and running. All you have to do is select one of the 6 available templates, customize both your Like-Gate and Reveal pages, and then publish your campaign. You can also schedule it to be published at a specific date and time. There are several different types of campaigns available which put like-gating to good use. You can create a product showcase, offer downloadable content, a printable coupon, or information on an event, fundraiser, and more. We caught up with Mark Schmulen, the General Manager of Social Media at Constant Contact to find out a bit more about the service, and why they launched it, as a way to help both small businesses who are just getting started in the social media game, but also for businesses that already have their feet firmly planted in the world of social media marketing. We know that more and more small businesses are using social media marketing, when we surveyed our own customer base we found that roughly 80% of them are using social media marketing. However when we asked them are they finding success, only around 60% said yes. And when you asked them to define that success, they sorta scratched their heads a little bit. So what we realized is a lot of small businesses are doing social media marketing because they feel that they have to, but they’re not really getting the business results that they’re accustomed to getting through marketing. The world of social media marketing is full of pitfalls, as we’ve seen with quite a few social media campaigns and posts, here and there, and while services like Constant Contact can’t help with these kinds of mistakes, it can certainly offer a valuable service to build up your audience, but it’s up to you to maintain that standing. This is a product that enables you to build a professional looking landing page on Facebook so that when people come to your page, they’re not just shown your wall, they’re shown something beautiful which entices them to like you on Facebook. And through that tab that they install on Facebook, they can run results-driven campaigns which are designed to grow their fanbase as well as engage their existing Facebook fans…and getting them to share the campaign with their friends, cause at the end of the day, the ultimate value of social media is getting your fans to spread the word. Schmulen describes social media as the next logical step in word-of-mouth marketing, using today’s available tools and technology, a form of marketing that has long been at the top of the list of many small businesses’ preferred tools. We would be failing our small business customers if all we did was enable them to publish something on Facebook, because, ‘if you build it they will come’ is a complete falsehood. You can’t just put something on Facebook, you’ve got to drive traffic there. Integrated within this product is simple share and simple send. Simple Share enables you to publish a link to your campaign across all of your social networks – Facebook, Twitter and LinkedIn – to as many of those accounts as you want. And you can customize the account depending on which account your publishing to. 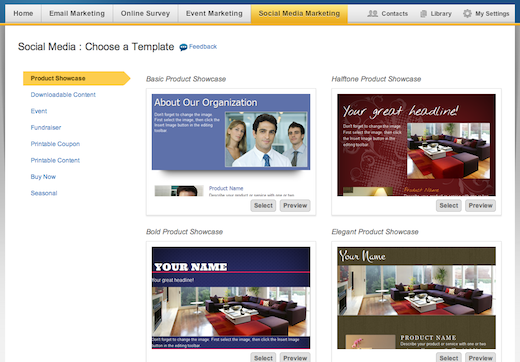 We also really demonstrate the power of combining email and social together. The Send functionality enables you to send out as many email invitations as you like. So if you already have a list of email subscribers you can hit them up in their inbox with a very nice looking email. This is a content management system for Facebook, and there’s other tools out there – this product is very different from those and I think one of the key things that defines it is that it’s much more robust. It has a drag-and-drop editor, and you can take any of our templates, organized by campaign type, and you can mix and match different things. You can add a video, add a buy-now button, a mailing list. It enables you to do whatever you want. All members can run one free campaign to test the product for themselves, while small businesses with under 100 fans can continue to use the service for free until they pass that milestone. Read next: "Founders are film directors. We get judged not by one film but by our body of work"